Or in this case: Binder twine. I just started delivering local papers and ads. 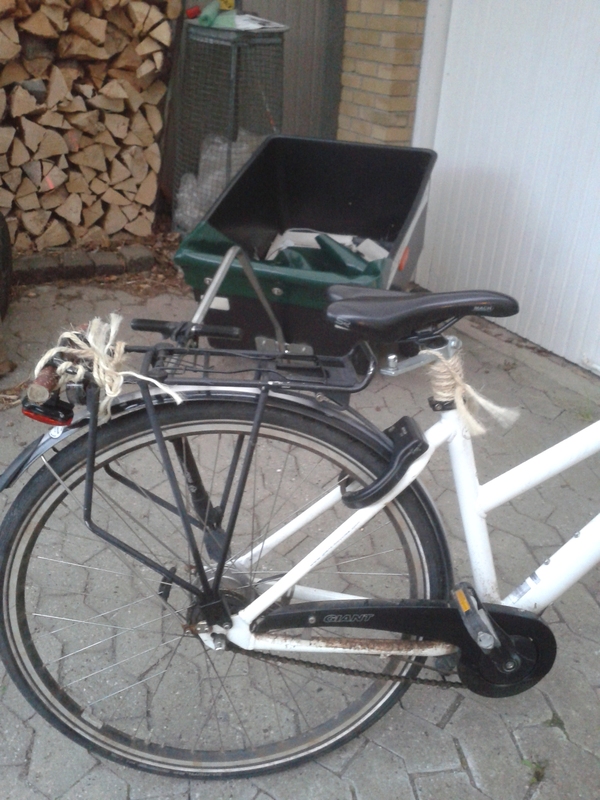 It’s heavy going, and my trusty bike is vital to getting the job done in reasonable time. Which I’m sure is the reason the distributor lends out the tralier seen in the background. Only snag is that it’s poorly designed. The fittings have to be tightened so much yet still manage to wrench loose and start sliding down the pipe holding the saddle. And the pin that supposedly will keep the tralier firmly stuck on the fitting is no good either. Good thing a true scout is never at a loss for ideas. or something to tie things together. A length of binder twine keeps the fitting from any downward slide. Another length keeps the rear light firmly stuck to the bike. And when the trailer is in use, a third length literally ties up the whole thing. Forget gaffer’s tape. Give me slid twine and neat knots any time.